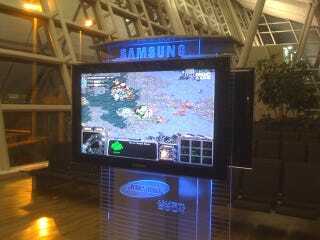 StarCraft isn't a game in South Korea, it's a national pastime. When gamers aren't playing it, they can watch tournaments on TV. But its creator, Blizzard Entertainment, is unhappy. And it has every right to be. Blizzard's Paul Sams appeared at a press conference in Seoul late last week and blasted cable channels MBC Game and OnGameNet for televising tournaments without the company's permission, reports the Korea Times. "It's unfortunate that the e-sports industry in Korea is lagging behind other industries in recognition of intellectual property (IP) rights and the basic principles related to them," said Sams. "Korea is the only region in the world where we have had to resort to litigation to protect our IP rights." Blizzard is considering launching a lawsuit against the Korea e-Sports Players Association (KeSPA). Blizzard allowed MBC Game and OnGameNet to show KeSPA tournaments until August — yet, the broadcasters continued to run StarCraft tournaments through the fall. Meanwhile, the game company signed an exclusive deal with Gretech-GomTV to show StarCraft tournaments. The argument that broadcasters are making is that games used in professional tournaments are public domain and it would be akin to Adidas billing to have its balls used in games. Sams was quick to reject that claim, noting, "Classifying StarCraft and other e-sports as part of the public domain deprives developers such as Blizzard of their IP rights. There will be no incentive to do what Blizzard had done to balance the games for competition, which is a more difficult task than creating a normal game." StarCraft isn't like Adidas footballs, and that analogy would better be suited to peripheral makers. StarCraft is Blizzard's show — every little thing in that game was created by someone at Blizzard. E-sports are a different beast than sports.